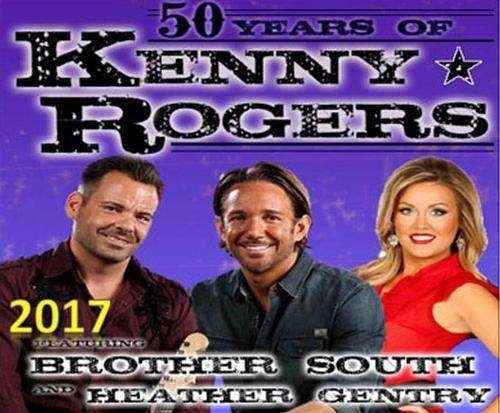 “50 Years of Kenny Rogers” is one of the newest shows in Branson not to be missed this 2017 at God and Country Theater. Shane and Dave of Brother South, Heather Gentry and Band of Gamblers will take you through the golden decades of music that made Kenny Rogers famous all over the world. In this show, you will hear the greatest hits of Kenny Rogers such as “The Gambler,” “Coward Of The County,” “Lucille,” “She Believes In Me,” “Every Time Two Fools Collide,” “Lady,” and “Islands In The Stream” and many other hits. Shane and Dave have been a long time entertainers in Branson since the past 7 years. The two take pride in the authenticity of their profession and for the love of music that they bring to each of their performances. When you book tickets for this show, Shane, Dave and Heather will take you Through the Years with “50 Years of Kenny Rogers.” Don’t miss this once-in-a-life time opportunity to celebrate the life and works of the famous Kenny Rogers. Watch the talented group of performers Brother South, Heather Gentry, and the Band of Gamblers for a journey through five decades of great music of Kenny Rogers. Born in Houston, Texas in 1938, Kenny Rogers’ career began after he recorded with the group The Scholars. The Scholars disbanded after the lead singer went solo and Rogers moved on to a solo career. Since then, the gifted singer has released over thirty studio albums, eighty singles and thirty Number One hits. He also received a number of awards and made a name for himself also as a songwriter, photographer, actor, record producer, entrepreneur and author. During the duration of his career as a solo artist, Rogers has topped the charts with hits like “Lucille,” “Daytime Friends,” “Love or Something Like It,” and “The Gambler.” He has also collaborated with other famous singers such as Lionel Richie, Dolly Parton, and many more. With a large collection of awards and honors to his name, Rogers has become one of the most recognized names in country music. Known for his identifiable sweetly raspy vocals and an extraordinary ability in entertaining audiences, Rogers has sold more than 120 million records worldwide and recoded more than 65 albums during his 52 years in show business. For over five decades, the world-famous entertainer has delivered songs that became popular around the world, drawing fans from many different backgrounds. Rogers has received hundreds of awards for his music and charity work, including three Grammys, 18 American Music Awards, 11 People’s Choice Awards, 8 Academy of Country Music Awards and five Country Music Association awards. In 1986, he was voted the “Favorite Singer of All-Time” in a joint poll by readers of both USA Today and People. The world’s popular singer is one of very few artists who have enjoyed successful careers in such a variety of genres – jazz, folk, country and pop. Rogers’ solo career shot into the highest level of popularity with the #1 hit, “Lucille,” which was named the CMA’s Single of the Year and was certified Gold. Then followed by “The Gambler,” a story songs so vivid it not only delighted country and pop fans, it also became a TV movie, starring himself in the title role. The movie became the longest running miniseries franchise on television and have attracted over 100 million viewers nationwide and launched a second career for him as an actor on television and movies. In 1977, Rogers received awards and accolades that included Country Music Association Awards Single of the Year “Lucille”; Academy of Country Music Awards Top Male Vocalist; Academy of Country Music Awards Singer of the Year “Lucille”; Academy of Country Music Awards Song of the Year “Lucille”; and Grammy Award for Best Male Country Vocal Performance “Lucille”. In 1978, Rogers received the following awards: American Music Awards for Favorite Single for ‘Lucille’; Country Music Association Awards Vocal Duo of the Year (with Dottie West); Academy of Country Music Awards Entertainer of the Year; and Academy of Country Music Awards Top Male Vocalist. In 1979, he received even more awards that included American Music Awards Favorite Male Country Artist; American Music Awards Favorite Country Album for 10 Years of Gold; Country Music Association Awards Male Vocalist of the Year; Country Music Association Awards Vocal Duo of the Year (w/ Dottie West); Country Music Association Awards Album of the Year for The Gambler; Music City News Country Male Artist of the Year; Music City News Country Single of the Year for 'The Gambler'; and Grammy Award for Best Male Country Vocal Performance on 'The Gambler'. From 1980 through 2013, Rogers continued to receive many similar awards. Some of the awards that Rogers received in between dates included USA Today Favorite Singer of All Time in 1986; Grammy Award for Best Duo Country Vocal Performance – ‘Make No Mistake She’s Mine (with Ronnie Missap) in 1988; BBC’s Greatest Country Singer Ranking – No. 2 in 1999; TNN Music Awards Career Achievement Award in 2000; CMT’s 40 Greatest Men of Country Music Ranking – No. 19 in 2002; International Buyers Association Lifetime Achievement Award in 2003; CMT’s 100 Greatest Country Songs ‘The Gambler’ No. 26 in 2003; and CMT’s 100 Greatest Cheating Songs ‘Ruby Don’t Take Your Love to Town’ – No. 6 in 2004. In 2005, Rogers was awarded CMT Music Awards for Favorite All Time Country Duet for ‘Islands In the Stream’ (with Dolly Parton); ASCAP Golden Note Award and CMT Music Awards Album of the Year for Water & Bridges both in 2007; ACM Honorso – Cliffie Stone Pioneer Award (with Jerry Reed, Randy Travis, Hank Williams Jr.) in 2009; American Eagle Award in 2010; Country Music Association Awards Willie Nelson Lifetime Achievement Award in 2013; and last but not the least, he was Inducted into the Country Music Hall of Fame this same year 2013. When Kenny Rogers held a concert in Indiana at the Shipshewana Event Center on March 7, 2011, he marked another new chapter to his remarkable music career. On that day, he made his first inspirational gospel album, “The Love Of God,” which became available exclusively at Cracker Barrel Old Country Store locations nationwide. That musical event featured 12 uplifting songs sung only the way Rogers can sing them, the record includes all-new recordings of classic hymns and gospel and contemporary songs that have inspired him musically and touched him spiritually through the years, dating back to his childhood growing up in Houston where he attended church regularly with his family. With his unique story and soulful voice, Rogers has continued his amazing music career into the 21st century with a critically acclaimed album (Water and Bridges) and hit single, "I Can't Unlove You," a gold certified record (21 Number Ones), and now, the sweetly timeless The Love of God.